SanDiegoVille: Ballast Point Brewing To Sell To Constellation Brands For ONE BILLION DOLLARS! Ballast Point Brewing To Sell To Constellation Brands For ONE BILLION DOLLARS! Constellation Brands top beers for 2016! So the whole 'going public' thing was really just a big FOR SALE sign for Ballast Point Brewing? Constellation Brands, a behometh beverage alcohol company known as being the largest wine company in the world, today announced an agreement to acquire Ballast Point for around $1BILLION. Ballast Point brews will soon join Constellation Brands line up of offerings that include Corona, Negra Modello, Pacifico and Tsingtao. Rumor has it that Ballast Point Spirits is not even part of this deal and will be spun off as a separate company with a new brand name. Ballast Point is one of the fastest growing craft beer companies in the US with a beer portfolio that includes more than 40 different styles of beer, led by its popular Sculpin IPA and Grapefruit Sculpin IPA. The takeover of Ballast Point gives Constellations Brands a foothold in the craft beer industry, strengthening its position in the highest end of the U.S. beer market. Ballast Point started in 1996 as a small group of home brewers. According to reports, Ballast Point will continue to operate as a stand-alone company with its existing management team and employees running the day-to-day operations. Ballast Point is on pace to sell nearly 4 million cases in calendar 2015, which would represent growth of more than 100 percent versus calendar 2014. Net sales for calendar 2015 are expected to approximate $115 million. Ballast Point employs more than 500 employees, produces beer in four facilities in the San Diego area, and sells its beer in over 30 states. Constellation Brands, a NY based company, owns more than 100 brands in wine, beer and spirits. Wine brands include Robert Mondavi, Clos du Bois, Franciscan Estates, Ravenswood, Blackstone, Nobilo, Kim Crawford, Inniskillin, Jackson-Triggs, Manischewitz and Arbor Mist. 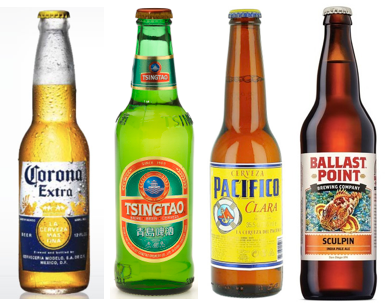 Beer brands include Corona, Modelo Especial and Negra Modelo, Pacífico, and Tsingtao. Spirits brands include Black Velvet Canadian Whisky, Svedka Vodka and Paul Masson Grande Amber Brandy. Constellation Brands plans to purchase Ballast Point Brewing & Spirits for approximately $1 billion. The transaction will be financed with cash and debt, and is expected to close by the end of calendar year 2015, subject to customary closing conditions.